Here’s an innovative shortcut to gaining a more intuitive understanding of both differential and integral calculus. 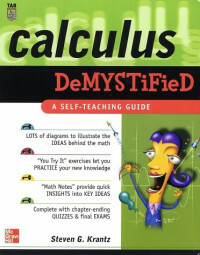 In Calculus Demystified an experienced teacher and author of more than 30 books puts all the math background you need inside and uses practical examples, real data, and a totally different approach to mastering calculus. With Calculus Demystified you ease into the subject one simple step at a time — at your own speed. A user-friendly, accessible style incorporating frequent reviews, assessments, and the actual application of ideas helps you to understand and retain all the important concepts. If you’ve been looking for a painless way to learn calculus, refresh your skills, or improve your classroom performance, your search ends here. Calculus Demystified explains this panorama of ideas in a step-by-step and accessible manner. The author, a renowned teacher and expositor, has a strong sense of the level of the students who will read this book, their backgrounds and their strengths, and can present the material in accessible morsels that the student can study on his own. Well-chosen examples and cognate exercises will reinforce the ideas being presented. Frequent review, assessment, and application of the ideas will help students to retain and to internalize all the important concepts of calculus. We envision a book that will give the student a firm grounding in calculus. The student who has mastered this book will be able to go on to study physics, engineering, chemistry, computational biology, computer science, and other basic scientific areas that use calculus. Steven G. Krantz is the Chairman of the Mathematics Department at Washington University in St. Louis. An award-winning teacher and author, Dr. Krantz has written more than 30 books on mathematics including a best-seller.